‘Fighting Furies’ were produced by Lesney under their Matchbox brand during the mid-1970s. 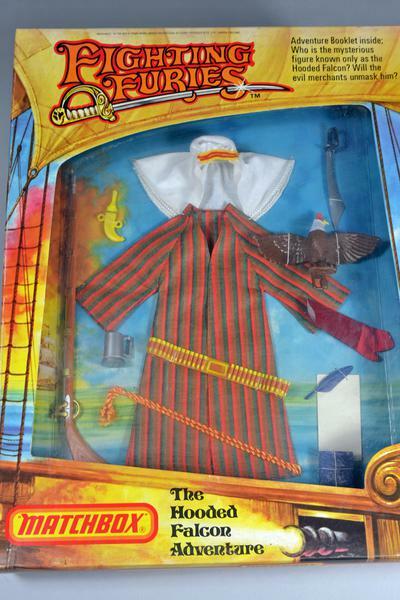 Originally pirate toys, they later included American Wild West accessories and characters. 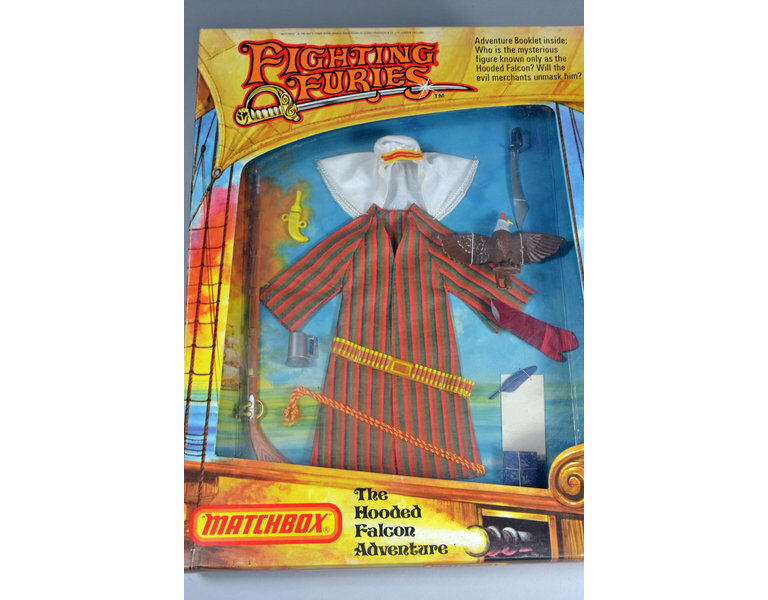 The toys are very much in the tradition of the adventure stories that were popular with young people since the 19th century, although ‘Fighting Furies’ are particularly reminiscent of 1930s and 1950s ‘swashbuckler’ films. The pirates, Captain Peg-Leg and Hook, bear many standard characteristics associated with fictional pirates: prostheses, cutlasses, tattoos and romantic outfits. 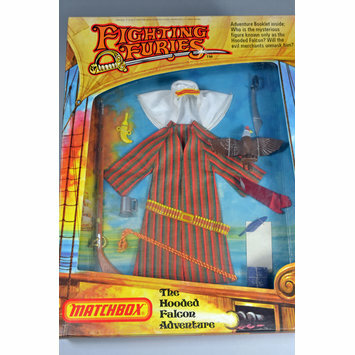 Their characters were originally supposed to have been rivals who later joined forces, embarking on a range of themed exploits described by the Adventure, Disguise and Action Pack accessory sets which were available for them. Boxed accessory set consisting of many parts designed for use with <i>Fighting Furies</i> action figures. The accessories are: a long rifle; a tankard; a curved dagger; a brown bulletbet with moulded yellow painted bullets; a white cotton gutrah (head scarf); a striped long robe; a scimitar sword; a plastic falcon wearing a red hood; a polyester velvet falconry gauntlet; a quill pen and page; a book. All is contained within (and is fastened to) a colour printed card box. There is also a printed paper leaflet containing instructions and details of the adventure associated with this set. Romantic, exciting and frightening stories about pirates and buccaneers have been told for centuries, with pirates alternately filling the role of dashing heroes, ambiguous anti-heroes and outright villains. The general twentieth century depiction of pirates and their activities was primarily descended from two fictional characters: the cunning, likeable and morally suspect Long John Silver from Robert Louis Stevenson’s Treasure Island (1882); and the highly-strung and flamboyant Captain James Hook from J.M. Barrie’s Peter Pan (1904). Silver’s appearance and personality was based on accounts of historic pirates from the historic ‘Golden Age’, formidable, charismatic and driven; Hook was a more comedic confection, concerned more with looking the part of a pirate than with committing actual piracies. From these we were given the caricatures of buried treasure on remote islands, prosthetic limbs and talking parrots, among other things. Pirates remained consistently popular throughout the century, peaking particularly in the 1930s and 1950s. Lesney Products & Co Ltd are best known for their range of die-cast toy vehicles marketed under the ‘Matchbox’ trade name. It was founded in 1947 as an industrial die-casting company by Leslie Smith (1918-2005) and Rodney Smith (1917-2013), the company’s name was derived from their given names. Lesney’s first toy car was made from 1948, and their first toys produced under the ‘Matchbox’ brand were available from 1953. As well as toy cars, action figures, slot cars and scale model soldiers were also produced by Lesney as ‘Matchbox’ toys.